1Instituto de Ciencias Biológicas, Av. Lircay s/n, Universidad de Talca, Chile. 2Instituto de Química y Recursos Naturales, Universidad de Talca, Talca, Chile. 3Escuela de Agronomía, Facultad de Ciencias Agrarias, Universidad de Talca, Chile. 4Centro EULA, Universidad de Concepción, Barrio Universitario s/n, Concepción, Chile. The concentrations of Cu, Cr, Fe, Pb and Zn in thallus of three species of epiphytic lichens were determined: Flavopunctelia flaventior, Phaeophyscia orbicularis and Ramalina ecklonii, collected in three sectors of Talca city (Region of Maule, Chile), which have been exposed to different human activities. The first collection of samples was carried out by Pereira & Tapia. in 1999 and those results were compared with samples collected in 2016. Metal determinations were made by flame atomic absorption spectroscopy, considering the thallus of each lichen as representative sample for analysis. The methodological validation was carried out using certified reference material (SRM-1570). The highest levels of concentration in the three sectors and for the two sampling periods were for Fe > Zn > Pb > Cu > Cr > Cd. In 1999, the range of concentrations of the heavy metals in dry wet varied 335.5-1724 μg/g for iron (Fe); 40.7-209.5 μg/g for zinc (Zn); 10.4-64.2 μg/g for lead (Pb); 10-28.7 μg/g for copper (Cu); 0.6-4.8 μg/g for chromium and 0.1-0.4 μg/g for cadmium (Cd) while in 2016 the ranges were 1356.6-14280.4 μg/g for iron (Fe); 26.8-179.5 μg/g for zinc (Zn); 13.5-102.5 μg/g for lead (Pb); 7.9-36.2 μg/g for copper (Cu); 3.6-24.6 μg/g for chromium and not detected for cadmium (Cd). The samples collected in 2016 generally showed higher concentration levels of Fe, Cu, Cr and Pb than those collected in 1999, especially those corresponding to the central area of the city of Talca. 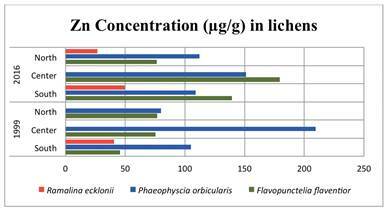 According to the results, the species that accumulated more heavy metals were P. orbicularis followed by F. flaventior and last R. ecklonii. It can be concluded that foliose species are potentially better candidates to be used as long-term bioindicators than the fruticose species. The downtown sector of the city is the most polluted due to the presence of tannery industries and the increase of vehicular traffic that the city has had in the last two decades as a result of agricultural development and population growth. Se determinó las concentraciones de Cu, Cr, Fe, Pb y Zn en talos de tres especies de líquenes epífitos: Flavopunctelia flaventior, Phaeophyscia orbicularis y Ramalina ecklonii, colectados en tres sectores de la ciudad de Talca (Región del Maule, Chile), expuestos a diferentes actividades humanas. La primera recoleccón de muestras fue realizada por Pereira & Tapia en 1999 y sus resultados se compararon con muestras colectadas el año 2016. Las determinaciones de metales se realizaron por espectroscopia de absorción atómica con llama, considerando para su análisis el talo de cada liquen como muestra representativa. La validación metodológica se realizó utilizando material de referencia certificado (SRM-1570). Los mayores niveles de concentración en los tres sectores y en los dos períodos de muestreo fueron para Fe > Zn > Pb > Cu > Cr > Cd. En 1999, el rango de concentraciones de los metales pesados en peso seco varió: 335,5-1724 μg/g para fierro (Fe); 40,7-209,5 μg/g para zinc (Zn); 10,4-64,2 μg/g para plomo (Pb); 10-28,7 μg/g para cobre (Cu); 0,6-4,8 μg/g para cromo (Cr); 0,1-0,4 μg/g para cadmio (Cd), mientras que en el 2016 los rangos fueron: 1356,6-14280,4 μg/g para fierro (Fe); 26,8-179,5 μg/g para zinc (Zn); 13,5-102,5 μg/g para plomo (Pb); 7,9-36,2 μg/g para cobre (Cu); 3,6-24,6 μg/g para cromo (Cr) y no detectado para cadmio (Cd). Las muestras colectadas el año 2016 presentaron en general mayores niveles de concentración de Fe, Cu, Pb y Cr que las colectadas el año 1999, especialmente las correspondientes a la zona central de la ciudad de Talca. De acuerdo a los resultados, las especies que más metales pesados acumularon fueron P. orbicularis seguidas por F. flaventior y R. ecklonii. Se puede concluir que las especies foliosas son potencialmente las mejores candidatas para ser usadas como bioindicadores de largo plazo que la especie fruticosa. El sector céntrico de la ciudad es el más contaminado debido a la presencia de industrias de curtiduría y al aumento de tráfico vehicular que ha tenido la ciudad en las últimas dos décadas producto del desarrollo agrícola y el crecimiento de la población. Lichens have been used worldwide as indicators of the presence of a high variety of atmospheric contaminants especially in urban and suburban areas. They are extremely sensitive symbiotic organisms which react to even slightly polluted air and they have certain required characteristics for an ideal biomonitor: large geographical ranges allowing comparison of metal concentration from diverse regions; a morphology which does not vary with seasons, thus enable accumulation to occur throughout the year (Markert 1993, Loppi et al. 2000). Considering that the lichens have no root, their mineral nutrition depends mainly on atmospheric inputs due to that lack of protective cuticle and stomata, thalli can accumulate mineral elements, including heavy metals, at levels exceeding their metabolic requirements. The accumulation of heavy metals is one of the most widely studied aspects of modern lichenology, because of its importance to biomonitoring (Nimis et al. 2001, Kinalioglu et al. 2006). Lichens accumulate heavy metals to a very high degree, with concentrations reflecting environmental levels of these elements (Herzig et al. 1989). Talca city is situated in Maule Region, is mostly agricultural, with some preserved woodlands, tannery industries and during the last two decades has had a high increase of vehicular traffic. Due to the input of heavy metals as product of these activities and the input of particulate material in suspension product of the earthquake registered in 2010, the purpose of this study is to find out if these factors determined the increase of the concentration of these metals in the same lichen species and sectors studied previously. The choice of these metals is due to the existence of other investigations in other types of environmental matrices in the Maule Region (Tapia et al. 2009, 2010), where the presence of Cu, Cr and especially Pb in the environment has been reported. Fe and Pb are normally present in the environment and are good indicators of human activity (Backor & Loppi 2009). The aims of this study were to determine the heavy metals concentrations of Cr, Cu, Fe, Pb and Zn in the lichen thalli of the three species of epiphytes lichen: Flavopunctelia flaventior (Stirton) Hale, Phaeophyscia orbicularis (Necker) Moberg y Ramalina ecklonii (Spreng.) Mey. et Flot. and to compare with those obtained 17 years ago from of the same sectors and in the same species in Talca city, Chile (Pereira & Tapia 1999). Sector 1: South zone, residential, moderate traffic, presence of tannery industries. It collected 9 samples in 1999 and 8 in 2016. Sector 2: Central zone, center city, commercial, with high traffic and influence of contaminants of Sector 1. It collect- ed 7 samples in 1999 and 7 in 2016. Sector 3: North zone of the city, residential, low traffic and no influence of industrial activities. It collected 8 samples in 1999 and 8 in 2016. 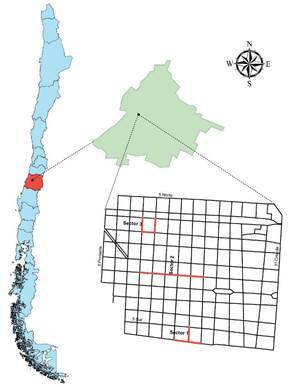 FIGURE 1 Map of Chile that show the Maule Region (left), Talca province (up to the center) and the map that show the studied area (right). / Mapa de Chile que muestra la Región del Maule (izquierda), Provincia de Talca (arriba al centro) y mapa que muestra el área estudiada (derecha). The lichen samples were obtained from bark using a Tef- lon spatula to avoid metal instrumental contamination. The phorophytes were Melia azedarach L., Acer negundo L., Prunus cerasifera Ehrh., Robinia pseudoacacia L., which have been introduced as ornamental in the area. Samples of each lichen species were deposited in Talca University Herbarium. PROCESSING OF THE SAMPLES FOR THE DETERMINATION OF METALS Lichen samples were labeled and lyophilized, ground and homogenized for chemical treatment. For the analysis, 0.5 g samples were weighed and added under hood 2 ml of bidistilled water and 10 ml of nitric acid p.a. The solutions were heated on a hotplate with constant stirring, to near dryness. Subsequently, the solutions were filtered using 0.45 μm porosity filters. The filtrate was brought to a final volume of 50 ml with bidouble distilled water. Metals determinations were performed by atomic absorption spectroscopy with flame (air/acetylene) (UNICAM spectrophotometer mod. 969). The instrument was calibrated with standard solutions of Fisher Scientific International Company. All determinations were performed considering their target solutions. The validation of the methodology was performed using certified reference material from the National Institute of Standards and Technology SRM-1570 (spinach). Table 1 shows the results of Cu, Cr, Fe, Pb and Zn measurements on the certified reference material. The repeats in the reference material showed good accuracy for these concentration levels, with relative errors ranging from 0.77% for Cu to 33.3% for Pb. TABLE 1 Concentration of Cu, Cr, Fe, Pb and Zn (mg kg-1) in certified reference material (SRM-1570). / Concentración de Cu, Cr, Fe, Pb y Zn (mg kg-1) en material certificado (SRM-1570). aThe concentrations are expressed in mg kg-1 (dry weight). / Las concentraciones están expresadas en mg kg-1 (peso seco). bAccuracy of data, expressed as relative error. / Exactitud de los datos expresada como error relativo. TABLE 2 Concentration of heavy metals in lichens of Talca city, Maule Region, Chile. / Concentración de metales pesados en líquenes de la ciudad de Talca, Región del Maule, Chile. N: Number of samples. (1)Results expressed in dry material. W/S: without sample. ND: not detected. / N: Número de muestras. (1)Resultados expresados en materia seca. W/S: sin muestra. ND: no detectado. In Table 2, it shows data of heavy metals content in lichen species from three sectors of the city of Talca in 1999 and 2016. The following graphs show the content of heavy metals accumulated in the lichen thalli situated in three sectors of Talca city in the Maule Region. Concentrations given for each metal corresponds to a representative sample of the total of collected material. The Cu concentration tends to increase in the three sectors in the foliose species in 2016, nevertheless, the uptake of this element does not occur similarly in these two species and the range vary from 14.6-36.2 μg/g dry wt. On the other hand, in the same year, the Cu concentration was lower than to the registered in 1999 in the fruticose species in the sectors 1 and 3 (Fig. 2). In 1999, the Cu concentration varied from 14.9-28.7 μg/g dry wt in the foliose species by considering the three sectors studied. 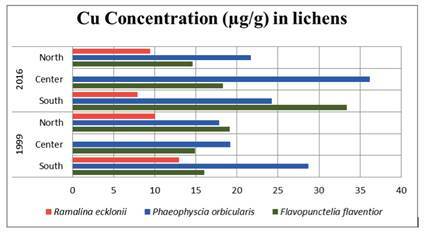 In the fruticose species, the concentration varied 10 - 12.9 μg/g dry wt in the sectors 1 and 3, where was present (Fig. 2). 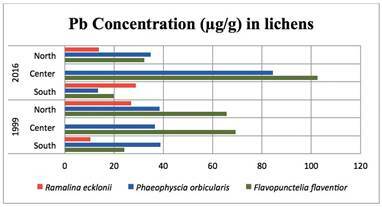 The Cr concentration increased in the three studied sectors, in Flavopunctelia flaventior and Phaeophyscia orbicularis in 2016, becoming higher in the sector 2 (center city), where it reaches a concentration of 24.6 μg/g dry wt in the lichen thallus of P. orbicularis, five times major to that registered in 1999. It is noteworthy that this element increase gradually in both species from its source, (tannery industries) located in the south sector of the city toward the center of this, for then to decrease in the north sector. In this same year, the concentration of this metal varied 3.6- 24.6 μg/g dry wt in the foliose species considering the three studied sectors, while that in R. ecklonii varied 6.9-12.2 μg/g dry wt in the sectors 1 and 3, where this species was present (Fig. 3). FIGURE 2 Cu concentration in lichens of Talca city in 1999 and 2016. / Concentración de Cu en líquenes de la ciudad de Talca en 1999 y 2016. In 1999, the Cr concentration varied in a range: 0.9-12 μg/g dry wt and 0.9-3.7 μg/g dry wt in the sectors 1 and 3 respectively considerate the three studied lichen species. In the sector 2, instead, the range varied between 0.9-4.3 μg/g dry wt considerate only the foliose species since Ramalina ecklonii not was detected in this sector in this year (Fig. 3). The Fe concentration it increased in the three sectors in the two foliose species in 2016. This increase is proportional from the south sector to north sector. The species that accumulate the highest concentration was Phaeophyscia orbicularis. In 2016, the concentration increase significantly in the two foliose species varied 1463.9-14280.4 μg/g dry wt and in the case of R. ecklonii, the concentration of this element varied 66.6-1437.8 μg/g dry wt (Fig. 4). In 1999, the concentration of Fe varied 309-1724 μg/g dry wt by considering only the foliose species in the three sectors sampled. For the case of R. ecklonii that only was present in the sector 1 (south) and 3 (north), the Fe concentration varied 335.5-384.5 μg/g dry wt (Fig. 4). 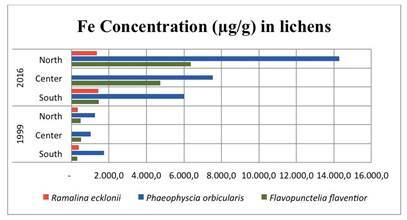 With respect to the Pb concentration in the lichens, it can observe that the highest concentration of this metal is concentrated in the sector 2 (center city) in the two foliose species in 2016. In this same year, the lowest concentration is register in Ramalina ecklonii, fruticose species present only in the sectors 1 and 3 instead in the sector 2 this species was absent (Fig. 5). FIGURE 3 Cr concentration in lichens of Talca city in 1999 and 2016. / Concentración de Cr en líquenes de la ciudad de Talca en 1999 y 2016. FIGURE 4 Fe concentration in lichens of Talca city in 1999 and 2016. / Concentración de Fe en líquenes de la ciudad de Talca en 1999 y 2016. In 1999, the concentration of this elemental varied of 24.2-69.2 μg/g dry wt in the foliose species present in the three studied sectors instead the range of this element in Ramalina ecklonii varied 13.9-28.9 μg/g dry wt in 2016 (Fig. 5). The Zn concentration also increased in two foliose species of the three studied sectors in 2016, but the species that more Zn accumulated was Flavopunctelia flaventior, except in the sector 3. In this year, instead in the foliose species varied 76.5-179.5 μg/g dry wt while in R. ecklonii register a concentration 26.8 μg/g dry wt only in the sector 3 (north) since in the others sectors no was detected (Fig. 6). In 1999, the range of accumulation varied 46.6-209.5 μg/g dry wt, in the foliose species in the three sampled sectors, while that in R. ecklonii varied 40.7-49.5 μg/g dry wt in the sectors 1 and 3 (Fig. 6). FIGURE 5 Pb concentration in lichens of Talca city in 1999 and 2016. / Concentración de Pb en líquenes de la ciudad de Talca en 1999 y 2016. FIGURE 6 Zn concentration in lichens of Talca city in 1999 and 2016. / Concentración de Zn en líquenes de la ciudad de Talca en 1999 y 2016. Accumulation of metals differs with species form of growth of the lichens and also with respect to location of the different sectors inside the city. Of the two species foliose used in this study Flavopunctelia flaventior and Phaeophyscia orbicularis, F. flaventior is the species that more accumulated heavy metals. This indicates that the growth form of thalli and degree of thallus adhesion to the substrate has a significant impact on metal concentrations in lichens. In general, the metal contents can be grouped depending of their absolute contents in the samples. The identified groups were elements with elevated concentrations (Fe and Zn); moderate concentrations (Pb and Cu) and very low concentrations (Cr and Cd) (Table 2). If it is compared the normal levels Fe, Zn, Pb and Cu of plants growing in unpolluted areas adjacent to urban ecosystems (nature reserves) in Russia and that could be considered as baseline (Meysurova & Notov, 2016), these vary in the following ranges: 50-250 μg/g dry wt for iron (Fe); 20-200 μg/g dry wt for zinc (Zn); 2-10 μg/g dry wt for lead (Pb); 5-20 μg/g dry wt for copper (Cu) respectively while, the levels of these same heavy metals determinate in this study were: 1463.9-14280.4 μg/g dry wt for iron (Fe); 76,5-179.5 μg/g dry wt for zinc (Zn); 13,5-102.5 μg/g dry wt for lead (Pb) and 7,9-56,2 μg/g dry wt for copper (Cu) respectively in foliose lichen species. In general, the ranges of these elements in Talca city in 2016 detected in foliose lichen species were 3 to 10 times greater than in plants come from of non-polluted areas. When comparing the ranges of heavy metals as Cd, Cr, Cu, Pb and Zn found in Parmelia caperata reported by Ite et al. (2016) of governmental areas from Eket and Ibeno, Akwa Ibom State, Nigeria, these elements varied: 0.006-0.092 μg/g dry wt for cadmium (Cd); 0.055-6.724 μg/g dry wt for chromium (Cr); 10.860-19.980 μg/g dry wt for copper (Cu). ; 0.841-0.998 μg/g dry wt for lead (Pb); 53.760-83.960 μg/g dry wt for zinc (Zn) respectively, while that in foliose species in Talca in 2016, these same metals ranged between: no detected for cadmium (Cd); 3.6-24.6 μg/g dry wt for chromium (Cr); 14.6-33.4 μg/g dry wt for copper (Cu); 13.5-102.5 μg/g dry wt for lead (Pb) and 76.5-179.5 μg/g dry wt for zinc (Zn) respectively. All the concentrations of these metals in Talca city were higher than those registered in governmental areas of Nigeria in the foliose species used. Our results allow us affirm that Talca city has significant levels of atmospheric contamination derived mainly from anthropogenic sources, whose are exposed in the results. 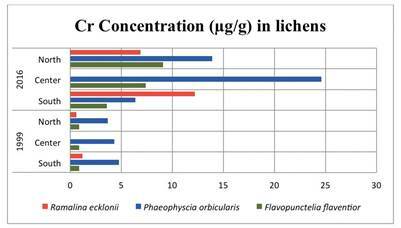 In basis to our results, Fe and Zn concentrations are the ones that reached the highest concentrations while the Cr concentration was the lowest in foliose lichens in 2016. This is consistent also with published data for foliose lichens in the Giresun city, Turkey (Kinalioglu et al. 2006). In Europe, the heavy metal concentrations of Cd, Cu, Fe, Pb and Zn measured in a Hypogymnia physodes epiphytic foliose lichen in a suburban area of Helsinki, Vuosaeeri, Finland (Lodenius et al. 2010) revealed the following concentrations: 0.32-1.5 mg kg-1 dry wt for Cd; 5-15 mg kg-1 dry wt for Cu; 440-4000 mg kg-1 dry wt for Fe; 2.8-16 mg kg-1 dry wt for Pb and 72-150 mg kg-1 dry wt for Zn, while that in foliose species in Talca in 2016, these same metals ranged between: no detected for Cd; 14.6-33.4 μg/g dry wt for Cu; 1463.9-14280.4 μg/g dry wt for Fe; 13.5- 102.5 μg/g dry wt for Pb and 76.5-179.5 μg/g dry wt for Zn respectively. The Cu concentrations were twice as high as those recorded in Vuosaeeri, Finland. They are also positively correlated with central part of the city due to high vehicular traffic. The particles of soil are the main cause of Cu in the atmosphere ((Richardson et al. 2001) which means that the dust caused by vehicular traffic explains in part our results. The Fe and Pb concentrations registered in Talca, Chile were notoriously higher than those registered in Vuosaeeri, Finland in the order of 4-5 times higher. The Zn concentration instead was more or less of the same order of magnitude in Talca, Chile as in Vuosaeeri, Finland. In South America, there is limited information about the determination of heavy metals in lichens in urban cities. Here, the case of Bariloche city, Argentina is analyzed, a non-industrial tourist city, whose levels of Cr, Zn y Fe in urban sites were: 0-2.31 μg/g dry wt for chromium (Cr); 0-29.2 μg/g dry wt for zinc (Zn) and 2325-2862 μg/g dry wt for iron (Fe) respectively (Ribeiro-Guevara et al., 1995), while in Talca city in 2016, the concentration of these same elements in foliose species were: 3.6-24.6 μg/g dry wt for chromium (Cr); 76,5-175,5 μg/g dry wt for zinc (Zn) and 1463.9-14280.4 μg/g dry wt for iron (Fe) respectively. When comparing, the concentrations of these three elements, it can observe that all these in the Talca city were superior to those of Bariloche city. The Fe and Zn concentrations detected in the Talca city, could be due to the high vehicular traffic that to experimented the city in the two last decades. The Zn particles present in the lichen thalli of Talca city could due to from wear of automobile tires, lubricating oils and brake pads according by (Garty, 1993, Garty et al. 1993). The greater accumulation of Cr in the central zone of Talca city seem to be related the dominance of the direction of the wind, being this south or southwest (Cabello 2009). Since that the tanneries industries are located in the south of the city and use high quantities of chromium in its industrial processes. Of this way the largest accumulation of this element is concentrated in lichens located in the center of the city. Also this high Cr concentration in lichens could be related to high vehicular traffic, since this metal is a common additive in unleaded gasoline, a component of antifreeze and parts of automobile bodies (Garty et al., 1993) or wood preservatives situated near of the city. Phaeophyscia orbicularis and Flavoparmelia flaventior are species that have a high rate of accumulation of the following Fe, Zn and Cr metals while for Pb, it seems to be an element capable of being removed by some metabolic mechanism present in the lichen thallus (Sarret et al. 1998). The authors acknowledge support from Project PIEI: Química y Bio-orgánica en Recursos Naturales and to Instituto de Ciencias Biológicas, University of Talca, Talca, Chile.